This article is about the men's senior tournament. For the women's tournament, see FIFA Women's World Cup awards. the Man of the Match Award (currently commercially termed as "Budweiser Man of the Match") for outstanding performance during each game of the tournament, first awarded in 2002. The Golden Ball award is presented to the best player at each FIFA World Cup finals, with a shortlist drawn up by the FIFA technical committee and the winner voted for by representatives of the media. Those who finish as runners-up in the vote receive the Silver Ball and Bronze Ball awards as the second and third most outstanding players in the tournament respectively. The current award was introduced in the 1982 FIFA World Cup, sponsored by Adidas and France Football, though fifa.com also lists in their player articles as "golden ball winners" Kempes, Cruyff, Pelé, Bobby Charlton, Garrincha and Didi for 1978, 1974, 1970, 1966, 1962 and 1958 respectively. Barcelona is the only club whose players have won the Golden Ball a record 3 times (Johan Cruyff in 1974, Romário in 1994, Lionel Messi in 2014). If there is more than one player with the same number of goals, since 1994 the tie-breaker goes to the player without a penalty goal, if none has a penalty then the tie breaker goes to the person with more assists - with the FIFA Technical Study Group deciding whether an assist is to be counted as such. If there is still more than one player, the tie-breaker since 2006 goes to the player who has played the least amount of time, which translates to a higher goal average. ^ FIFA initially credited Nejedlý with only four goals, which would make him joint top scorer with Angelo Schiavio of Italy and Edmund Conen of Germany. However, FIFA changed it to five goals in November 2006, making Nejedlý the outright top scorer. ^ FIFA initially credited Leônidas with eight goals. However, in November 2006, FIFA confirmed that in the quarter-final tie against Czechoslovakia, he had scored once, not twice as FIFA had originally recorded, meaning he had scored only seven goals in total. ^ There was controversy regarding the number of goals Brazilian Ademir had scored in 1950, as a result of incomplete data concerning the Final Round game Brazil vs. Spain (6–1). The 5–0 goal had been credited to Jair, but is now credited to Ademir. ^ Salenko is the only player to win the award playing for a team that were eliminated in the group stages. His six goals are the only international goals he ever scored. ^ Despite the assist tiebreaker, Salenko and Stoichkov remained tied with 6 goals and one assist each, and both received the Golden Shoe. ^ Romário and Andersson surpassed the other two players with five goals (Jürgen Klinsmann and Roberto Baggio) by having three assists each. ^ Both runners-up had the same number of assists, and each received the Silver Shoe. ^ During the tournament, after the group stage match against Costa Rica, Ronaldo logged a protest against the crediting of a goal as an own goal, and FIFA granted him the change. ^ a b Eight players had scored three goals. Ronaldo, Crespo and Zinedine Zidane stood out for having one assist, and then the two recipients were determined by less playtime (308 minutes for Crespo, 411 for Ronaldo, 559 for Zidane). ^ a b c Müller, Villa, Sneijder and Diego Forlán tied with five goals. Müller won by virtue of having more assists (3) than the rest (each had one). Villa won the Silver Boot due to playing fewer minutes than Sneijder, and Sneijder won the Bronze Boot due to having played fewer minutes than Forlán. ^ Neymar, Lionel Messi and Robin van Persie all had four goals in the tournament. Neymar received the Bronze Boot for playing fewer minutes than his competitors (480; Messi played 693 minutes, and Van Persie, 548). ^ a b Griezmann, Lukaku, Denis Cheryshev, Cristiano Ronaldo and Kylian Mbappé tied with 4 goals. Griezmann won the Silver Boot by virtue of having more assists (2) than the rest (Lukaku had one, the rest had zero). Lukaku won the Bronze Boot due to having more assists (one) than Cheryshev, Ronaldo or Mbappé (zero). The Golden Glove Award is awarded to the best goalkeeper of the tournament. The award was introduced with the name Lev Yashin Award in 1994, in honor of the late Soviet goalkeeper. The FIFA Technical Study Group recognises the top goalkeeper of the tournament based on the player's performance throughout the final competition. Although goalkeepers have this specific award for their position, they are still eligible for the Golden Ball as well, as when Oliver Kahn was awarded in 2002. In the event of a tie, the Golden Glove Award goes to the goalkeeper who progressed furthest in the competition. The next tiebreakers are saves made, then minutes played. Although the Golden Glove Award was first awarded in 1994, every All-Star Team in World Cups prior to 1998 except 1990 included only one goalkeeper. The Best Young Player award was awarded for the first time at the 2006 World Cup in Germany and given to Germany's Lukas Podolski. The award is given to the best player in the tournament who is at most 21 years old. For the 2018 World Cup, this meant that the player had to have been born on or after 1 January 1997. The election took place on FIFA's official World Cup website with the help of The FIFA Technical Study Group. FIFA organised a survey on the Internet for users to choose the "best young player" of the World Cup, between 1958 and 2002, named the best young player of each tournament. With 61% of the overall vote, the winner was Pelé, who finished ahead of the Peruvian Teófilo Cubillas, the best young player at Mexico 1970, and England's Michael Owen, who reached similar heights at France 98. The FIFA Fair Play Trophy is given to the team with the best record of fair play during the World Cup final tournament since 1970. Only teams that qualified for the second round are considered. The winners of this award earn the FIFA Fair Play Trophy, a diploma, a fair play medal for each player and official, and $50,000 worth of football equipment to be used for youth development. The appearance of the award was originally a certificate. From 1982 to 1990, it had been a golden trophy based on Sport Billy, a football-playing cartoon character from 1982 who became an icon for FIFA Fair play. Ever since 1994, it is simply a trophy with an elegant footballer figure. Peru was the first nation to win the award after receiving no yellow or red cards in the 1970 FIFA World Cup held in Mexico. Peru's FIFA Fair Play trophy award. 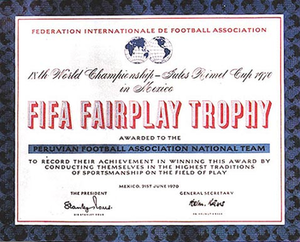 Peru won the award after receiving no yellow or red cards in the tournament. The Man of the Match award picks the outstanding player in every game of the tournament since 2002. While the inaugural two editions were chosen by the technical group, the Man of the Match is since 2010 picked by an online poll on FIFA's website. The FIFA Award for the Most Entertaining Team is a subjectively awarded prize for the team that had done the most to entertain the public with a positive approach to the game, organised through public participation in a poll starting in 1994. The All-Star Team is a team of the best performers at the respective World Cup finals. The ways in which the FIFA All-Star team members have been chosen has varied from year to year. A technical study group consisting of journalists - mostly from Europe and South America - and experts has historically chosen the team. However, in 1994 FIFA decided to add an official squad, chosen by the FIFA technical group and under the brand name MasterCard All-Star Team. For 1998, 2002 and 2006, substitute and reserve members were also nominated for full 22 and 23-player squads. The All-Star team wound up dropped prior to the 2010 tournament - coincidentally, three years after FIFA changed its sponsorship from MasterCard to Visa. In 2010, an equivalent of the All Star Team was an online poll to FIFA.com Club members named "Dream Team", sponsored by Yingli. The Dream Team poll returned the following edition sponsored by Oi, and again in 2018 sponsored by Hisense. While FIFA did not release an official list for 2014, official sponsor Castrol published a team of the tournament based on their Castrol Performance Index, which evaluates players' performances through statistical data. Similarly, McDonald's sponsored in 2018 a fantasy football game, whose team of highest-scoring players was published after the tournament. Only two players have been named in three separate All-Star teams whose selection only included the starting eleven: Djalma Santos in 1954, 1958 and 1962, Franz Beckenbauer in 1966, 1970 and 1974. Philipp Lahm also achieved it in 2006, 2010 and 2014. However, the 2006 edition listed 23 players and 2014 had two All-Star team listed. Lahm's name has only been in one of these. 21 players have been named in two separate All-Star teams: Luis Monti (1930 and 1934; representing Argentina and Italy respectively); Garrincha (1958 and 1962); Pelé (1958 and 1970); Bobby Charlton (1966 and 1970); Ruud Krol and Rob Rensenbrink (1974 and 1978); Berti Vogts (1974 and 1978); Paolo Rossi (1978 and 1982); Michel Platini (1982 and 1986); Diego Maradona (1986 and 1990); Paolo Maldini (1990 and 1994); Dunga (1994 and 1998); Roberto Carlos, Rivaldo, and Ronaldo (1998 and 2002); Lilian Thuram and Zinedine Zidane (1998 and 2006); Michael Ballack and Miroslav Klose (2002 and 2006); Marcelo and Thiago Silva (2014 and 2018). Pelé hold the record of the longest time between being named in two separate All-Star teams by 12 years apart (1958 and 1970). Uruguay in 1930 and 1950, Spain in 2010 and Germany in 2014 are the only teams to have had a player in every position on the All-Star Team. Germany and Italy achieved it in 2006, however, the 2006 edition listed 23 players. Uruguay in 1930 and Italy in 2006 have the most players selected in the All-Star Team with 7 players each. However, the 1930 selection only had 11 players overall, while the 2006 selection had 23. 37 different Brazilian players have been named in All-Star teams, Brazil is also the nation with most nominations with 44 nominees in every position except goalkeeper. Only three players from North American zone and two from each the African and Asian zones have been named to All-Star teams, Bert Patenaude and Claudio Reyna from the United States in 1930 and 2002, as well as Luis Gabelo Conejo from Costa Rica in 1990, Hong Myung-bo and Yoo Sang-chul of South Korea in 2002 and Roger Milla from Cameroon in 1990 and El Hadji Diouf from Senegal in 2002. Another player from each zone has been named in reserves: Jay-Jay Okocha from Nigeria in 1998, Hidetoshi Nakata from Japan in 2002 and Landon Donovan from the United States in 2006. Only one player on the victorious 1986 Argentina team, Diego Maradona, was selected in that year's All-Star team. Uniquely, brothers Brian Laudrup and Michael Laudrup were both selected for the All Star Team from Denmark in 1998. Similarly, Cesare Maldini and Paolo Maldini are the only father and son players that were both selected for the All Star Team from Italy, in 1962 and 1990, 1994 respectively. Uniquely, Argentinian compatriots Diego Maradona (1979 and 1986) and Lionel Messi (2005 and 2014) are the only players that won the Golden Ball award at both FIFA World Cup and FIFA World Youth Championship. ^ "2014 FIFA World Cup: Awards". FIFA.com. Retrieved 20 July 2014. ^ "FIFA eliminates official World Cup All-Star team". USA Today. 21 July 2010. ^ "Golden Ball winners in World Cup history". SI.com. Retrieved 15 July 2018. ^ "World Cup Best Players (Golden Ball)". Topend Sports. Retrieved 23 June 2018. ^ a b c "FIFA World Cups: Awards" (PDF). FIFA.com. Archived from the original (PDF) on 30 June 2016. Retrieved 2007-06-19. ^ a b "Champions at a Glance". FIFA. p. 14. Retrieved 20 July 2014. ^ a b c "adidas Golden Shoe - FIFA World Cup™ Final". FIFA.com. Retrieved 20 July 2014. ^ a b c "Romario is voted the top player of World Cup '94 and winner of the FIFA/adidas Golden Ball award; Salenko and Stoichkov tie as leading scorers for World Cup USA '94". Business Wire. 17 July 1994. [FIFA] has announced Oleg Salenko (Russia) and Hristo Stoichkov (Bulgaria) as [...] winners of the prestigious adidas Golden Shoe award [...] who made six goals and one assist each. Kennet Andersson (Sweden) with 5 goals and 3 assists, will receive a Bronze replica of the Predator [...] Throughout World Cup '94, three points were awarded for each goal scored and one point for each assist leading to a goal, with a maximum of two assists per goal. Assists are only taken into account if two or more players scored the same number of goals. ^ Bryan, Rebecca (11 July 1994). "Football by the numbers". Los Angeles: Agence France Presse. the assist has gained enough ground to earn a place in the calculations for the Golden Boot award, which in every previous World Cup has been awarded solely on the basis of goals scored. Under the formula, players get three points for a goal, and one point for an assist. "We made a two-point difference because we do not want someone who did not score winning the award," a FIFA official said. ^ "2014 FIFA World Cup Brazil – Awards – adidas Golden Boot". FIFA.com. Retrieved 20 July 2014. ^ "FIFA World Cup: Statistics" (PDF). FIFA.com. Retrieved 20 July 2014. ^ a b "American Bert Patenaude credited with first hat trick in FIFA World Cup history". Fifa.com. Retrieved 20 October 2011. ^ "Match Report; Brazil – Spain 6:1". FIFA. Archived from the original on 26 March 2013. Retrieved 9 March 2013. ^ "Most World Cup goals". Sportskeeda. Retrieved 9 May 2018. ^ "1978 FIFA World Cup Argentina – Awards". FIFA.com. Retrieved 31 March 2015. ^ "1986 FIFA World Cup Mexico: Awards". 20 July 2014. ^ "1994 FIFA World Cup Technical Report" (PDF). FIFA Technical Group. 1994. p. 82. In Kenneth Andersson they had one of the most prolific scorers in their ranks - he was jointly awarded the "Bronze Shoe" for the third best goal-scorer, together with Brazil's Romário. ^ "Ronaldo voted Best Player at France 98". FIFA.com. 27 July 1998. Retrieved 20 July 2014. ^ "An unforgettable football festival with several winners". FIFA.com. 31 October 2002. Retrieved 20 July 2014. ^ "Ronaldo handed fourth goal". Sky Sports. Archived from the original on 1 May 2011. Retrieved 12 July 2010. ^ a b c "2006 FIFA World Cup Official FIFA Awards: Zidane wins adidas Golden Ball award". FIFA.com. 10 July 2006. Retrieved 14 July 2014. ^ "2006 FIFA World Cup Germany - Statistics - Players - Top goals". FIFA.com. Retrieved 20 July 2014. ^ "Golden Boot". FIFA. Archived from the original on 17 March 2012. Retrieved 9 June 2012. ^ "Golden Boot". FIFA. Retrieved 14 July 2014. ^ "Golden Boot". FIFA. Retrieved 15 July 2018. ^ a b FIFA.com. "FIFA World Cup™ Archive - FIFA.com". FIFA.com. Retrieved 27 August 2017. ^ "Hyundai Young Player Award". FIFA.com. Retrieved 20 July 2014. ^ "FIFA World Cup Best Young Player Award". footballdatabase.com. Retrieved 11 March 2009. ^ "Pele, Best Young Player Ever". newagebd.com. Archived from the original on 21 August 2009. Retrieved 11 March 2009. ^ "Muller named Hyundai Best Young Player". FIFA.com. 9 March 2011. Retrieved 9 June 2012. ^ FIFA.com (14 July 2014). "Hyundai Young player award : Paul Pogba". FIFA.com. Retrieved 27 August 2017. ^ "Golden consolation for magical Modric". FIFA.com. 15 July 2018. Retrieved 15 July 2018. ^ "XXI. Special awards and protocol" (PDF). FIFA. p. 52. Retrieved 19 October 2008. ^ David Goldblatt and Jean Will. A History of the World Cup in 24 Objects (PDF). De Montfort University, Leicester. p. 18. ^ "FIFA Award Trophies" (PDF). FIFA.com. Retrieved 20 July 2014. ^ "España campeón, del fair play, en Sudáfrica 2010". Peru.com. 14 July 2010. Retrieved 20 October 2011. ^ 2002 FIFA World Cup Korea/Japan: Report and Statistics, p.44: "Marketing and Partners" and p.49: "Budweiser Man of the Match"
^ "Man of the Match". 2006 FIFA World Cup Official Website (Yahoo!). Archived from the original on 11 July 2006. Retrieved 20 July 2014. ^ "Man of the Match". FIFA.com. Archived from the original on 15 June 2010. Retrieved 20 July 2014. ^ "Man of the Match Rules". FIFA.com. Retrieved 20 July 2014. ^ "Korea Republic win Most Entertaining Team Award". FIFA.com. 22 June 2014. Retrieved 26 June 2014. ^ "Users declare Portugal most entertaining team". FIFA.com. 22 June 2014. Retrieved 26 June 2014. ^ a b "WORLD CUP '94; Romario and Baggio Among First All-Star Cast". The New York Times. 16 July 1994. ^ "FIFA eliminates official World Cup All-Star team - USATODAY.com". usatoday30.usatoday.com. Retrieved 27 August 2017. ^ a b "FIFA Technical Study Group designates MasterCard All-Star Team". FIFA.com. 10 July 1998. Retrieved 20 July 2014. ^ a b 2002 FIFA World Cup Korea/Japan: Report and Statistics, p.106: "MasterCard All-Star Team"
^ "The FIFA TSG nominates 23 players for the MasterCard All-Star squad". FIFA.com. 7 July 2006. Retrieved 20 July 2014. ^ a b FIFA.com (15 July 2010). "Spaniards dominate Dream Team". Retrieved 27 August 2017. ^ a b FIFA.com (15 July 2014). "Dream Team winners earn Sony prizes". Retrieved 27 August 2017. ^ FIFA.com (18 July 2018). "FIFA World Cup Fan Dream Team". Retrieved 18 July 2018. ^ FIFA.com (23 July 2018). "Fan Dream Team and prize winners revealed!". Retrieved 25 July 2018. ^ a b "Castrol Index Top 11". FIFA.com. Fédération Internationale de Football Association. Archived from the original on 19 December 2014. Retrieved 20 July 2014. ^ a b "Kane crowned King, Mina the PPG VIP". FIFA.com. Fédération Internationale de Football Association. Retrieved 25 July 2018. ^ "Pavard's stunner voted Hyundai Goal of the Tournament". FIFA. Retrieved 25 July 2018. "1982 FIFA World Cup Technical Report" (PDF). FIFA Technical Group. 1982. "2002 FIFA World Cup Korea/Japan: Report and Statistics" (PDF). FIFA Technical Group. 2002.